From an ergonomic standpoint, keyboards are perhaps the most important computer accessory to pay attention to next to the mouse. Whether you’re a PC or Mac user, all of our fingers are in constant contact with our keyboard for hours everyday. When it comes to computer keyboards, the two main types are membrane (standard) and mechanical keyboards. Each comes with distinct pros and cons that as any computer user, we owe it to ourselves to understand. 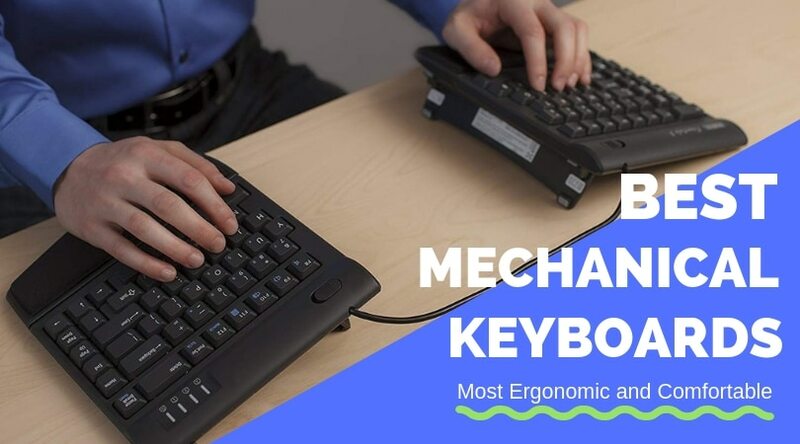 In this guide, I’ll try to lay out the key differences, plus the top 5 ergonomic mechanical keyboards to consider for better posture, less wrist and finger fatigue, and faster typing. Which Mechanical Keyboard will you Choose? For people who have never used a mechanical keyboard, they may also never be motivated to consider one, as on the surface, mechanical and regular keyboards all look pretty much the same. Much of the differences with a mechanical keyboard have to be felt to be appreciated. But first thing’s first. What defines a mechanical versus a membrane keyboard? 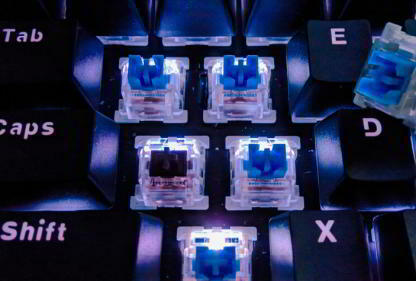 Mechanical keyboards are based on mechanical switches below each keycap that sends a signal when it is pressed. Membrane keyboards, on the other hand, have the keys sit on top of a double-layered membrane so that when a key is pressed, the two membrane layers are pushed together to send a signal. In short, both mechanical and membrane keyboards start with pushing a key and end with sending a signal, but the stuff that happens in between is different, resulting in a very different typing experience. One of the most noticeable differences between a mechanical and regular keyboard is the physical sensation when typing. With a mechanical keyboard, each key press produces a very tactile, clacky feeling, whereas on a regular membrane keyboard, the experience is often best described as mushy. Typists and gamers generally prefer the former thanks to the clear physical feedback each successful key press. It also feels more “satisfying”. In general, membrane keyboards are quieter than mechanical keyboards. This is because the rubber or silicone surface of the membrane doesn’t produce much sound when pressed. The analog switches of mechanical keyboards on the other hand tend to be louder when depressed (especially the blue switches). For people who love the tactile experience of typing on a mechanical keyboard but could do without the noise, there are switches such as brown that are much quieter. Due to these differences in materials and manufacturing process, mechanical keyboards are generally much more expensive than membrane keyboards. The upshot is that mechanical keyboards tend to last a lot longer than membrane keyboards; an average mechanical keyboard lasts around 50 million keystrokes, compared to 10 million for membrane keyboards. Mechanical keyboards tend to be heavier than membrane keyboards because they are made of more substantial parts, whereas membrane keyboards are largely plastic. In some cases, having a heavy keyboard is good because it stays in place on a desk, but if you want to take your keyboard on the road, it’s nice to have a lighter one. A defining characteristic of mechanical keyboards compared to their membrane counterparts is the degree of customization the former affords. Like lego parts, every key cap can be replaced on a mechanical keyboard, creating a completely personalized keyboard should you wish. Modular mechanical keyboards even allow you to replace each switch with a different one to customize the typing experience. Different switches have very different characteristics such as noisiness, force required to press, sensation etc. Heavy typists and gamers love mechanical keyboards due to their overall better responsiveness. The keys on the mechanical keyboards require less force to register, making them more ergonomic for your fingers. They also support multiple key presses at once (N-key rollover), so typing is typically more responsive and accurate on a mechanical keyboard, especially if you are typing very fast. Easier to Clean, with each key cap being removable. Are Mechanical Keyboards More Ergonomic? For heavy typists, the short answer is yes. 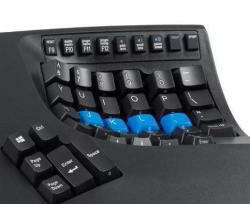 While both mechanical and regular membrane keyboards come in ergonomic form factors such as split design, tenting and negative sloping, the former with its physical switches offer distinct advantages when it comes to ergonomics that simply cannot be duplicated using a membrane construct. 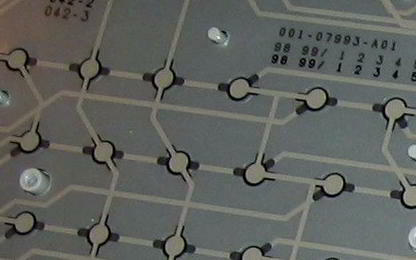 The keys on a regular keyboard sit on top of a flexible membrane that when pressed sends a signal to the bottom most layer to complete the circuit and register a key press. Think of it as pressing down on a mushy surface- it takes quite a lot of energy, and there’s little tactile feedback on when a key was successfully pressed. As such, “blind” typing is almost impossible on a membrane keyboard, and you’re forced to press each key all the way down to the very bottom to be certain you’ve completed the action. Using physical switches on the other hand, the keys on a mechanical keyboard require less force to successfully activate, with a clear tactile feedback that lets you type much faster, without constantly checking your screen for typos. Furthermore, mechanical keyboards support n-key rollover, where simultaneous presses to multiple keys can all be registered properly. 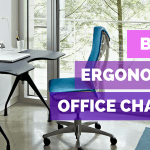 These factors combined enable heavy typists to not only type faster, but with less energy exerted, which overtime can make a huge difference in terms of ergonomics. The chances of fingers and hand strains are reduced, and as many of the nerves in your body are connected, even dreaded ailments such as carpal tunnel syndrome. While the keys on a mechanical keyboard are overall more responsive, you can further customize the typing experience by going with a particular mechanical switch for your keyboard. The most well known switches are the MX Cherry Switches. Different colored Cherry MX switches exhibit different behaviors, from force required to activate a key, to different travel distances, tactile feeling and noise. Here is a quick comparison of the 5 most popular MX Cherry Switches. Note: Th volume of the key presses in the audio playback below have been increased 3x from the actual level to make it easier for you to hear and distinguish. MX Brown switches are great for heavy typists due to the blend of tactile feedback yet quiet keys. This enable fast typing without the accompanying chorus. MX Red switches are a favorite among gamers thanks to the ultra smooth, linear typing experience. The lack of audio and tactile feedback, plus ultra low activation force all combine to create the least amount of resistance and distraction when engaging friends and foes alike. For typists that appreciate the feel and sound of old school typewriters, Cherry MX Blue switches are the best choice. They provide a clear tactile plus loud audio feedback whenever a key is pressed. Many people describe the typing experience on MX Blue switches as very "satisfying", though the loud noise makes them less than ideal in tight cubicles and shared spaces. Best described as MX Red Switches with a heavier "feel", the Black Switches are great for gamers that want the same responsive experience as the red switches, but with more resistance as you depress each key. This can be helpful in reducing accidental key presses. Very similar to the MX Blue Switches but with more resistance for people who prefer "heavier" keys. In general, heavy/fast typists and gamers will find mechanical keyboards well worth the extra cost compared to normal membrane keywords due to the distinct benefits the former provides. 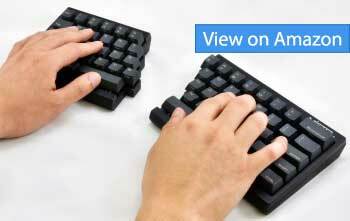 Casual keyboard users on the other hand will find a regular ergonomic keyboard more than adequate for everyday use. It should be noted that if you are drawn to mechanical keyboard but are concerned about the louder noise the keys produce, there are mechanical keyboards that are very quiet, such as those that utilize red or brown switches instead of the more noisy, clicky blue switches. 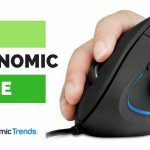 Should you decide that the distinct advantages of mechanical keyboards are worth the extra cost, the question is, which ones currently on the market are the most ergonomic? 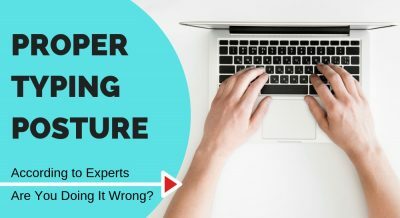 In general experts agree keyboards with a split design are more ergonomic, by putting your arms in a more relaxed reversed “v” shape as you type, with your shoulders externally rotated. To relax the wrists and reduce forearm pronation, keyboards that support tenting (raised in the middle) and negative tilt (lower at the back of the keyboard) are also key attributes to look for in the keyboard. With that said, the following are the 5 top ergonomic mechanical keyboards for 2019. 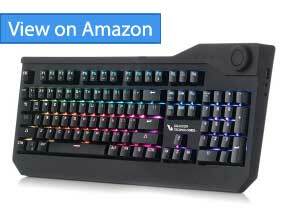 While it’s hard to go wrong with any of them, read our detailed reviews to see the one that best fits you based on how you use a keyboard and your budget. Don’t be taken back by the radical design of the Kinesis KB600 Advantage2 Keyboard- given enough time, this might just be the most comfortable keyboard you will ever use. Every aspect of the Advantage2 mechanical keyboard is designed to conform to the natural posture of your shoulders, arms, wrist and hand at rest, creating a typing experience that is as ergonomic as they come. The hallmark of the Kinesis Advantage2 keyboard are the two concave bowls where the majority of the keys are housed. Such a design puts your wrists and fingers at complete ease as you type. You may have read about the importance of a negative tilt in your keyboard for ergonomics- well, the two bowls achieve just that while keeping the keys close together to further reduce the travel distance to access them. Another important ergonomic feature of the Advantage2 mechanical keyboard is the built in tenting, where the keys near the middle slope upwards of 20 degrees. 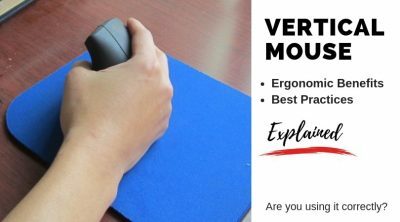 Such a design reduce pronation of your forearm and wrists as you type, decreasing your chances of developing wrist pain and even carpal tunnel syndrome. If there’s one downside of the Advantage2 keyboard, that is the steep price, even for a mechanical keyboard, at around $320 (check price). While it’s true you can’t put a price on health, if this is simply out of your price range, know that most of the other mechanical keyboards on this list come with at least one key ergonomic feature that is split design for around half of the cost. 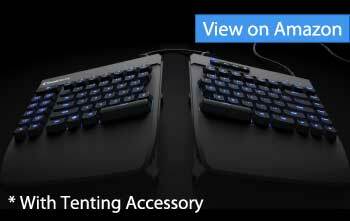 To achieve tenting, accessories are available with these less expensive keyboard to derive the same benefit as the Advantage2. The Freestyle Pro Ergonomic Keyboard is a great example of a simple yet effective split keyboard design. Keyboards in this format are divided into two halves connected by a single flexible cord. With this design the halves can be placed independently in any configuration. As one user review noted, this is especially useful if you feel shoulder pain while typing and need to move your hands further apart. Another user commented that they didn’t realize their hands were being hurt by their old keyboard until they got this ergonomic one. As with most mechanical keyboards, the Freestyle Pro Ergonomic Keyboard is highly customizable, as is evidenced by the user-friendly key binding and macro-programming functions. Unfortunately, there is no numpad on this keyboard, but there is a bank of keys on the left side that default to functions such as copy and paste that could be programmed to suit any need. The brown cherry MX switches in the mechanical keys are easy to press and relatively quiet for a mechanical keyboard. Recommended: To maximize the ergonomic benefits of the Freestyle Pro keyboard, I highly recommend the VIP3 Pro Tenting Accessories that adds tenting and a wrist pad to the keyboard. Tenting raises the middle of the keyboard so your wrist and hands are at a more natural sloped angle when typing, with your palms facing each other. The VIP3 add on supports 3 different settings- 5, 10, or 15 degree sloping. The Mistel Barocco Ergonomic Keyboard is a split keyboard with style. As with the first keyboard discussed in this list, the Mistel Ergonomic Keyboard has two halves that can be put in any orientation. Separating the keyboard can have surprising benefits: one user noted that in addition to feeling more comfortable in the wrists and fingers, he also experienced reduced shoulder and back pain due to the inverted “v” shape his arm can assume when typing. A customizable system of backlight LEDs adds a sleek gaming aesthetic to the Mistel Barocco Ergonomic Keyboard. You can have all the key margins light up in one color or a whole rainbow. A noteworthy feature of the Mistel Ergonomic keyboard is N-key rollover. Usually found on high end keyboards, this means that multiple keys can be pressed at the same time and all registered properly. Practically speaking, N-key rollover translates into more responsive and accurate key presses, which not only improves your typing speed, but is great for tasks such as gaming that demand split second responsiveness. Last but not least, I’d be remiss not to mention that the Mistel keyboard lets you pick the type of switches you want to use, between brown, red, blue, black, or even transparent. 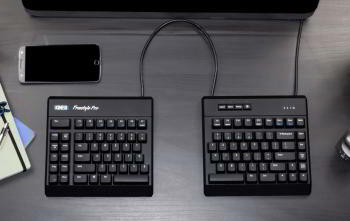 This lets you tailor the Cherry MX switch based on your type of work and desired typing experience. Brown or blue are typical switches good for typists while black and red are super responsive for gamers for example. The KINESIS Freestyle Edge Split Mechanical Keyboard is similar to the Freestyle Pro Ergonomic Keyboard mentioned earlier, with the main differences being detachable wrist support and blue backlighting. It is advertised as the first split keyboard designed for gaming, and it certainly has the features to back that up. What makes the Kenesis an awesome mechanical keyboard for gaming? Two main features are the ultra responsive Cherry MX Red switches (other choices available), plus the Smartset Engine that lets you easily remap keys and assign macros. Throw in 9 custom layouts and game keys, and your keyboard becomes your secret weapon in dominating your foes in the next round of Call of Duty or your favorite MMO title. The detachable wrist pads of the KINESIS Freestyle Edge Mechanical Keyboard is also a welcomed addition for heavy typists or gamers. They designed to keep your hands and wrists at a natural angle, and are wide and long enough to provide comprehensive support. It should be noted, however, that the supports are plastic and are not covered with any padding. To sum up, the KINESIS Freestyle Edge Split Mechanical Keyboard is at the front of the list when it comes to split mechanical ergonomic keyboards for gaming. Recommended: As with the other Freestyle keyboard on this list, tenting functionality is available as a separately sold kit. Many users say that getting the keyboard tented is well worth it for long-term comfort. Last on our best list is the Drakken Mechanical Gaming Keyboard, one that focuses squarely on gamers looking for a reliable, highly responsive mechanical keyboard below $100. The physical design of the Drakken Technologies Mechanical Gaming Keyboard is both durable and ergonomic. The inner frame is reinforced with steel for extra strength and the outside frame is rubberized to be comfortable to the touch and also to prevent the keyboard from sliding around on the desk. 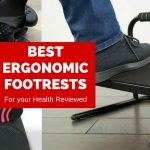 The adjustable keyboard feet are also rubberized, and while the lack of split design in this keyboard makes tenting impossible, the tilt achieved by adjusting the feet still allows for some ergonomic relief. This is a distinctive gaming keyboard with next-level backlight functionality. 16.8 million colors are available, and an endless variety of patterns can be programmed in. For example, certain keystrokes can be linked to the backlight around specific keys changing. These options make space for great creativity. Users love the built-in control dial to easily change the backlight brightness and color with a simple dial. For a mechanical gaming keyboard, this Drakken Technologies model is relatively affordable, and users report that it feels like quality and has all the customization options expected in mechanical keyboards. Overall the Drakken Technologies Mechanical Gaming Keyboard is a great option if you’re accustomed to the design of standard keyboards, but want the tactile and responsiveness a mechanical keyboard brings. Next to a mouse, a keyboard is probably the part of a computer that people spend the most time in contact with, so it’s worth making sure that your keyboard gives you good ergonomic support and provides a comfortable and efficient typing experience. A good ergonomic mechanical keyboard could change the way you use your computer more than you expect. Wonderful insight into keyboards. I had no clue about the variety available, especially the different types of keys. As a journalist, my work is all about typing. As you can imagine, I suffer from wrist pain. Going ergonomic is my last attempt at avoiding any medication or surgery. I’ve just now ordered the Kinesis KB600 with cherry brown switches on your recommendation. Hoping that it works out for the best. I have used a few ergonomic keyboards over the last two years and recently got the KB600. I can say that from a pain relief point of view it is excellent, but even having used similar keyboards before, it takes a good two weeks to get used to it. At home, I use the Redragon S101 for gaming only, and that’s a great keyboard to have. But I’m a little tempted to get the Drakken because of the back-light control, even though it is almost twice the price. I’m a freelance writer and have to do a lot of typing work, which resulted in me having quite severe repetitive strain injury. It took me a while to finally get all the proper equipment for my work from a desk chair to a vertical mouse, but the keyboard has resulted in making my pain go away the most. I’ve now been using the Mistel Barocco for a couple of months. Because of the “v” shape that my hands now take automatically, it wasn’t just my fingers, but also my shoulders and upper back that felt relaxed. I was a little worried about the keyboard at first because they do promote it as a gaming board, but it works just fine for typing. I do believe it is slightly more expensive than other ergonomic keyboards but worth it. For first time users, give it some time and patience. You won’t regret it. I started using the Kinesis KB600 Advantage 2 a month back and buying it was one of the best decisions I ever made. The design feels different at first, and it took me about 10 days to really get used to it, but now my wrists and my shoulders don’t hurt so much. On a different note, I didn’t know about all the various switches there are, but good to know that my keyboard has the Cherry MX Brown which is good for heavy and fast typists. Thanks John. It is good to see the different options for ergonomic keyboards. I really like the Kinesis KB600 Advantage2 Keyboar, except the price. I suffer from wrist pain frequently when I am writing for my clients. My current keyboard has been useful and has not caused me any other problems. I originally thought my wrist pain was strictly a result of my age. This review of ergonomic keyboards has made me think about that. I have never heard of the term tenting before. I tried to find the definition but only found forums referring to it according to keyboards. However, I think I now have a fair understanding of tenting. I do have one question. Do you know of any other similar keyboards where the degree of tenting is more or less than 20 degrees? I look forward to your response. I’m so glad that you have listed the Drakken. I recently purchased it for home use, and it’s fantastic. As someone who uses the keyboard a lot at work and then comes home to play games, you can imagine the condition my hands are in by night time. I already see a difference in my wrist pain using the Drakken, but now I need an ergonomic one for work that looks a little more professional. Between the Kinesis Freestyle and the Mistel Barocco, which one would you recommend? I don’t write too much, except lots of emails and quick entries on the keyboard. I will need a separate number pad because that’s part of my main work. Price isn’t such an issue, however, looking at the details, doesn’t the Kinesis seem more suitable for an office desktop? I am a complete novice when it comes to keyboards and couldn’t even imagine that there are so many different types of switches, each with its unique characteristics. Many thanks for such an educational post. Now, I’m urgently looking for an ergonomic keyboard, because only recently my doctor suggested that the pain in my wrists could be the advent of CTS. At present, I like everything about the Kinesis Freestyle Edge. Since I love nostalgia, I like the idea of selecting the blue switches for that old typewriter sound. Is the Freestyle good for writers as I don’t do gaming? Also, should I get the tenting functionality in the beginning, or first get used to the keyboard and then get it done? Thank you so much. Sorry to hear about your wrist pain. Tenting is especially important if you suffer from CTS to keep your forearms and wrist in a neutral position when typing. 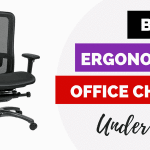 The Kinesis Advantage2 would be my recommendation- it comes with tenting and a downward slope design built in, the ideal posture experts recommend when typing to minimize the risk of injuries. Thank you for a fabulously detailed article. I started freelance writing a year ago and still use a standard keyboard. The last couple of months I have noticed a lingering pain in my wrists, and I do feel it is time to go ergonomic now. I think it is too early to try some of the more contemporary ones, but I do like the Mistel Barocco. 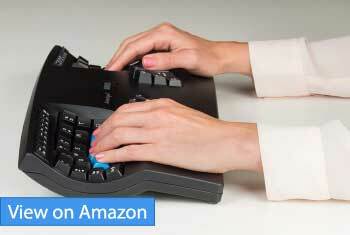 The funny thing is that you mention about a user having relieved their shoulder pain by using this keyboard. 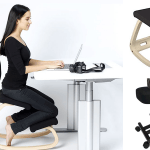 I have that too and never associated it with the keyboard posture. The customisation options in the Mistel are pretty awesome, and the N-key rollover sounds like something that would help with my typing speed. As someone who has never used a similar keyboard, aren’t the LED backlights distracting? Great work Jon! Thanks for actually providing audio samples of how different mechanical switches sound. It’s one thing to say the blue switches are “clicky”, it’s another to actually hear it. As someone who is noise sensitive, it really helped me settle on the type of switch I want to go with my first mechanical keyboard. I honestly thought mechanical keyboards equate to old-school keyboards! Apparently, they are still around, and better than ever. I remember way back when my mother was a typist for a large firm. It still blows me away knowing she was using the old style long press typewriter. It was completely manually operated. My mum could type accurately at 90 to 100 words per minute, with long keypresses! I like my current Logitech K120 keyboard, though my fingers do get kinda fatigued at the end of the day. I guess it’s due to the membrane layer at the bottom. Thanks to this review I think I’m gonna give Kensis Advantage2 a try. I learnt two new things today: the difference between mechanical and membrane keyboards, plus all the details about the type of switches, which I never thought about before. Secondly, I always figured mechanical means old school keyboards. So, thank you for all the information. Looking at the details, I love the contemporary looks of the Kinesis KB600 and that it has onboard memory. But as someone who types a lot, I’m worried how long it might take to get used to it. Do you think the Kinesis would be good for gaming as well? The Drakken, on the other hand, is more classic and is pretty impressive with the knob to adjust the backlight plus it has a number pad, which makes it suitable for my office work along with gaming.